How much longer must we keep pretending that a toy with an antenna is actually detecting bombs? How can we take solace in the illusion of security it offers? We have all seen this device and its equally fraudulent variants. And we have all wondered, at one point or another, how this supposed marvel of security technology is meant to protect us. ADE-651 is an instrument that’s been used by security personnel at the entrances of high-value facilities in various countries. The guard marches by the car with the device in hand, its swivelling antenna jutting out at a right angle to his body. The makers of this contraption claim that the antenna turns in the direction of a substance that it is programmed to detect. The device was produced by ATSC in the United Kingdom. After exhaustive investigation by the BBC, amongst other organisations, its export was banned in 2010 by the British government. About three years later, ATSC was dissolved while its founder – Jim McCormick – was convicted for fraud and imprisoned. Countries that had been duped into using this instrument began to taper down and ban its use. The instrument cost the Iraqi security forces $85 million and was widely used in that country until earlier this year. Since 2007, a vast number of vehicles armed with explosives have driven past these devices undetected, killing and injuring thousands. 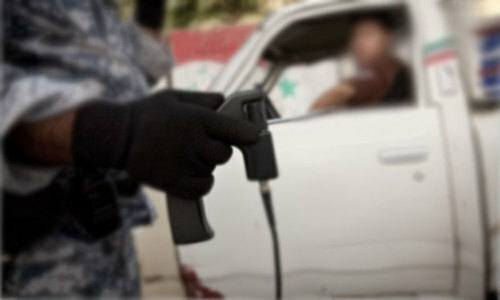 It was only after the horrific Karrada bombings in July 2016 that the Iraqi Prime Minister demanded the withdrawal of these fake bomb detector wands from security checkposts. In Pakistan, however, we are slow to learn lessons concerning national security despite many scientists and senators alike questioning the continued use of khoji (the local variant of ADE-651). High-value civilian facilities across Pakistan, from airports to upscale shopping malls, are still being guarded by personnel equipped with these fake bomb detectors. It is far too late for this to be signed off as mere oversight, including how there has not been a statement about our awe-invoking apathy towards loss of civilian life. 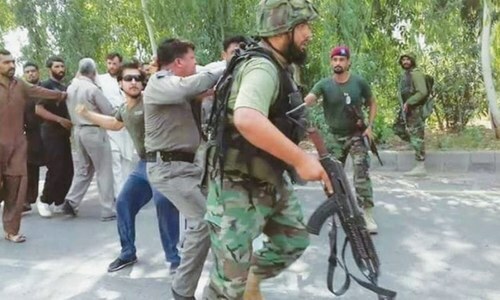 The average Pakistani citizen’s rising impatience with security as time-consuming pageantry rather than a practical service has been observable over the last few years. Metal detectors beep continuously as throngs of disgruntled shoppers and bankers pass straight through them with security officers rarely batting an eye. Whatever weapon one could potentially wield is masked by the welter of metallic objects carried or worn by the person. Who dares to ask a cinemagoer to remove his belt and shoes as he hurries through to catch his movie? What purpose does a metal detector serve when you have no intention to pay heed to its alarm? It fulfills precisely the same function as a fake bomb-detector wand: an illusion of security. Security apparatus in the absence of an effective system and a workable protocol is like a scarecrow in a corn-field; we just hope the crows don’t call our bluff. Sentencing McCormick, Judge Richard Hone noted that the man selling the fake bomb detectors not only committed fraud, but likely caused death and injury to countless innocents by bestowing a false sense of security. The same “false sense of security” in Pakistan appears to be accepted as official policy. If the public were to realise that the barbed-wire fence separating them from the terrorist is nothing more than a mirage, panic may ensue. The terrorist, in all likelihood, already knows it. The solution thus far hasn’t been to replace the mirage with something real; but to try and act more convincingly. Bogus bomb detectors, even as placebo, have outlived their usefulness to the public. If real security cannot be asked for, we can at least hope that the authorities have another trick lined up for us. Faraz Talat is a doctor from Rawalpindi who writes mostly about science and prevalent social issues. You nailed it. Traveling in and out of the country, I always was shocked to see these being used at the airports. Hopefully, somone of authority will read your article and wake up before it's too late. Yes, you take life into your own hands, when you travel in and out of Pakistan, and through all major airports where this dumb device is used. Not much can be said for security around major government buildings, major hotels and other places where security is adhoc as best! Somebody has to still give us a dishonest politician detecting device, as the ones that we have are fake! Spot on with your comments ! But the sense of having fake security did not just rest in Pakistanis but also anyone planning to harm our people. No matter how mere but the bad organisations do realise that something is still thee to stop them (this does not mean I am supporting the use of fake detectors). There should be a system in place at a higher level for awareness and changing this at a large scale but the person (security guard) standing with this magical wand (supposedly) or next to a metal detector still is protector our nation and our people, we owe him at-least that much. No wonder in a country where a car can run on a water kit, these toys can detect explosives..! this is the level of security agencies..! cant even find the difference between fake and real devices..! I can recall an PPP MNA from Baluchistan who once said " degree is degree, if it is a fake or original ". The fake bomb detector was made in UK, also this resembles something similar to a "twig" that is held in the hand by so called "water diviners" where ever the twig turns to whilst held between the palms of the hands means that, this where the water is in the ground. So this inventer has taken the same idea as the "water diviner's" except in his case many hundreds if not thousands have lost their lives, the UK courts did right to imprison this fraudster. I even saw this "toy" being used at Karachi airport in June of this year, on my visit! So what do the people of Pakistan expect? They elect legislature and parliamentarians with Fake Degrees, and no government experience, skills or even interest in solving the problems of the people. But run for office on false promises, exaggerated claims, fake personas and people still buy their nonsense and vote them in. And this is the result. Learn to live with it. Or live without peace of mind. The money that should've been allocated to better security measurements, technologies and training, has no doubt been spent on luxuries for the elected officials who are responsible for this debacle and insult to the collective intelligence of those already have nothing but utter contempt for these incompetent officials. I have been part of the security agency for almost a decade and a half and i know how effective this device is. The device commonly known as khoji works perfectly fine if used correctly as per the instructions. It was a big scam and the person who invented and sold was jailed in the UK. I was also surprised to see the device still being used in Pakistan. The only people who know in Pakistan that it doesn't work are the terrorists. It's not the police or airport security who use it but other forces too which I dare not take that name. These fake detectors were also used by Britain and some other nations. Your comment presents great, first-hand, relevant information about our security agencies. I agree with some of the points but from an engineers perpspective, the article does not state the whole truth. This device is like a metal detector.It can detect heavy metals and movement is due to magnetic field. I have personal experience and have tested this also. Therefore, it can detect some weapons but has little potential for detecting a suicide bomb.. I expect tomorrow the government will convene a meeting to setup a committee, to investigate this matter. 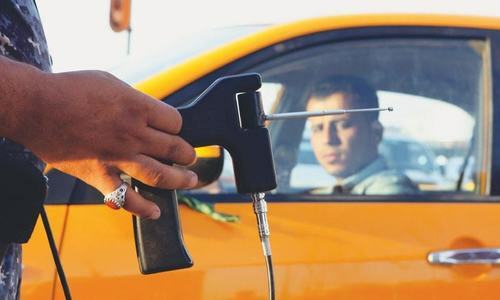 They will meet at a local five-star hotel once a month, where their cars will be searched and scanned using the very same detectors! Bullet and bomb proof limos, jammers and dozens of security guards are for political elite. If we elect these politicians, aren't allowed to highlight their flaws and the flaws in their policies then we have to remain content with these toys for our security. I had first hand an experience at the Airport while we were traveling, and the security personal had this particular device and he was marching along our three cars, boooom my car was the one where the antenna moved to words my boot, they, politely asked us to remove our suit cases out of cars and place them on the walk way. only one suitcase was indentified, you know why there were our shampoos and other liquids. after inspecting they let us go. so I think these devices do work.. Very true. It is obvious that the secuirty check specially in front of malls and hotels are just show off, they don't prevent anything. In a country rife with corruption, VIP culture, and little value placed on the lives of the ordinary citizens, your dialog with the security personnel, already answered the question of why this device is still in use. Firstly, the power elites have VIP security protocols safeguarding them, and they don't deal with the threats posed by these ineffective devices to the ordinary civilian or the lowly security personnel wielding it. Secondly, the statement that the device is a product of the ordinance factory hints of kickbacks and corruption at the higher echelons of the armed forces, which aren't immune from the scourge of corruption. I think they are trying the old saying "Dehshat hi kafi hai"
@Salman Like never…they believe anuthing they are told. They dont bother to ask how or why since they are taught not to ask any questions in school. @M. Sami Dear Sir, How can an antenna detect an explosive chemical is more of a common sense issue rather than an engineering issue. So far I have not heard of any antennas which could detect chemicals, antennas can only detect frequencies upto a certain range. I'm not sure how people claiming here the device works have tested the device. The only reliable way and best way to detect explosive material is to use sniffer dogs which have to be trained and then tested from time to time when in field. I met the security head at the Centaurus mall and despite my attempts to convince him, he was rock solid in his conviction - "we have successfully modified it for use in Pakistan - it works well, we have tested it with actual stuff....". I gave up and walked away. You cannot convince illiterate fools. Now, now, the corrupt money makers right through the chain of authority, really don't want their regular nest egg disturbed. That's why nothing will change. As for safety of citizens , don't be ridiculous, it's not important, only politicians are the important. Any kickbacks involved in the purchase of these fake detectors ?